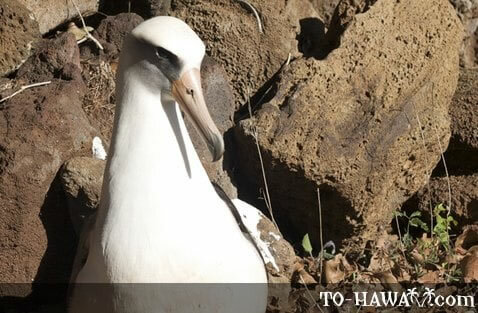 Known as moli in the Hawaiian language, the Laysan albatross is common in the Northwestern Hawaiian Islands. On the main Hawaiian islands, it can be found at Kilauea Point and Barking Sands Beach (Kauai), at Kaena Point (Oahu) and on the islands of Molokai, Lanai and the Big Island. Adult and juvenile birds have a black back and tail and a white body. They have a black patch around their eyes. Their bill, legs and feet are pale pink. Their courtship displays are complex and most birds mate for life. Nests are built in the sand in which a single white egg is laid.